FADS ShowWare is a simple software program for managing FADS schooling shows. It was designed to assist FADS show managers and secretaries. The program is based on MS Access. It runs on PCs; it does not run on Apple computers. 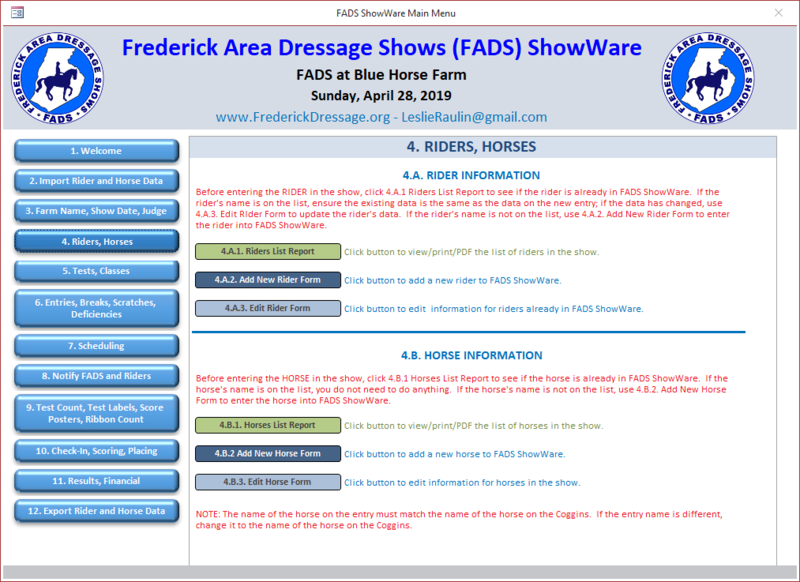 CURRENT VERSION: Version 2019.1 of FADS ShowWare was released February 19, 2019. New form to enter farm name and show date. Clarification of bridle numbers, class numbers, test numbers, etc. Added judge name(s) so the name(s) are on various reports, including tests sheet labels. Added ability to use rider and horse data from a previous show. Changed FADS ShowWare folder from C:\FADS to C:\Users\Public\FADS. This will allow users without administrative privileges to run the program. Added a feature to delete a duplicate or additional Show Name / Date in case a user accidentally enters more than one Show Name / Date. Updated tests: 2018 FEI dressage, 2018 USEA dressage. More details in the User Manual for using MS Excel to help schedule the show (an optional step). Tests added and updated, including 2019 USDF and USEF tests. Decreased text sizes so the program is more usable on laptop computers or computers with smaller monitors. Added VACCINATIONS field to the entry so secretaries can track receipt proof of vaccination, if required for the show. Added 11.B.2. Save Financial as an Excel File so users can track their financial data with an Excel file. As with Fox Village Dressage (the program used by MANY licensed shows, click here), to use FADS ShowWare, the computer must have Microsoft Access 2013 or later or the Microsoft Access 2013 or later runtime version (free download - instructions are in the FADS ShowWare User Manual). FADS ShowWare was developed by a computer hobbyist, not a computer professional; therefore, the author is not responsible for the program results. Its use is restricted to individuals to whom the program has been directly provided by the author to run FADS shows. FADS ShowWare is intended for one-day dressage schooling shows with one to three rings; it is not intended for licensed/recognized dressage shows. Program improvements are anticipated. Enjoy using the program. Send your suggestions to Leslie Raulin at LeslieRaulin@gmail.com. FADS Farms that want to use FADS ShowWare may request a copy by submitting the FADS ShowWare Agreement below.